Maybe you missed The Outer Dark Symposium in San Jose two weekends ago, and wish you could’ve attended all the panels and readings? If so, you’re in luck, because The Outer Dark is also a podcast, and they’re starting to run audio of some of that programming. First up, the Word Horde sponsored reading from Friday night, featuring Scott R Jones, Tiffany Scandal, Rios de la Luz and me. Upcoming installments of The Outer Dark podcast will feature panels and other readings. It was a great convention, and now’s your chance to check it out. I’ve signed and sent off to the publisher my copy of the contract for my second collection, The Human Alchemy. It will be coming out in June, and we will be talking about it well before that. Watch out! 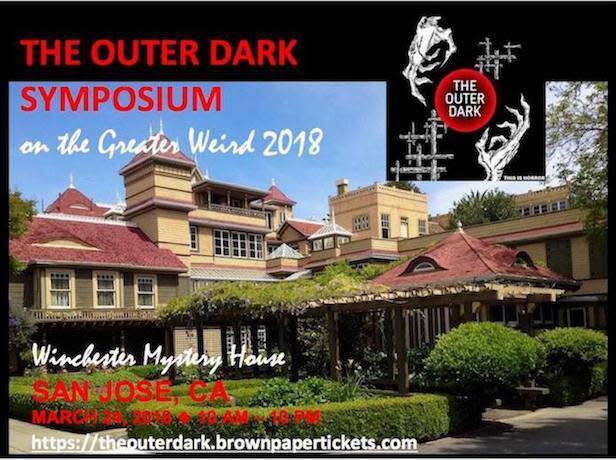 Next week I’ll be heading down to San Jose, California for the 2018 Outer Dark Symposium, held this year at the famous and scary Winchester Mystery House. The Indiegogo fundraiser supporting this event still runs for two more days, so you can look HERE for supporting memberships, or to purchase donated books and other perks. I’ll be part of a Friday evening reading, along with Rios de la Luz, Tiffany Scandal and Scott R Jones, at the Plaza Suites hotel. The Symposium proper happens on Saturday, with four panels, all of which sound interesting to me. I’ll be a panelist on panel #3, “The Frame is the Landscape. In between the panels are individual readings. After, we’ll be taking guided tours of the Winchester Mystery House. Sunday, after the Symposium is officially closed, there will be a breakfast, then a few off-site activities for those who aren’t heading home immediately. This should be tons of fun! I’ll post photos for those who can’t be present, as much as possible. I look forward to seeing many good friends again, and meeting new ones for the first time. In just over two weeks, I’ll be attending the Outer Dark Symposium in San Jose, California. You can read more about the event, and possibly help support it, at the Outer Dark Symposium Indiegogo page. There’s also a Facebook event page here. The symposium, which takes place at the Winchester Mystery House, should be a fun and unusual gathering, smaller than conventions like NecronomiCon or ReaderCon, more intimate and packed with only the coolest Weird weirdos. In fact, it appears the Friday reading event has its own event page (distinct from the Outer Dark Symposium event page) on Facebook here. This will be my first time at the Outer Dark Symposium (there was an event last year in Atlanta). I believe this gathering promises to be a lot of fun, and I look forward to seeing many friends among the scheduled guests and random attendees.